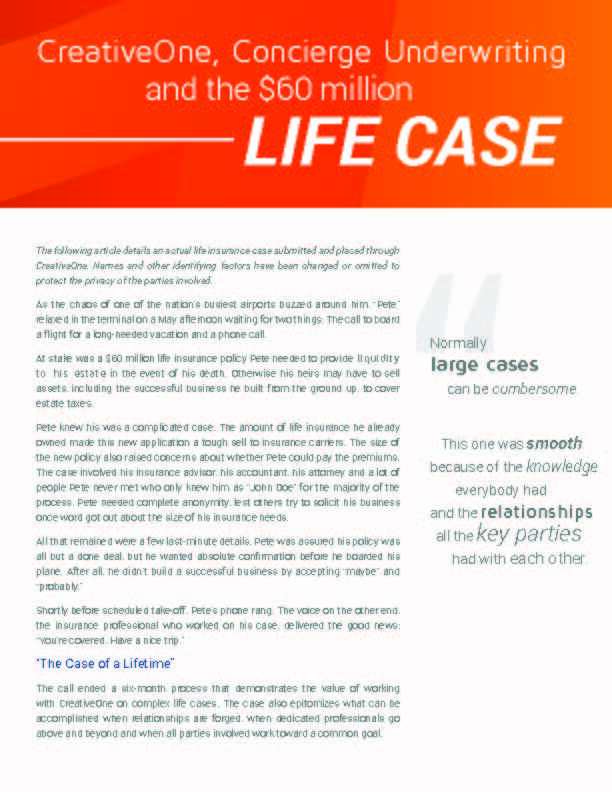 The following article details an actual life insurance case submitted and placed through CreativeOne. Names and other identifying factors have been changed or omitted to protect the privacy of the parties involved. As the chaos of one of the nation’s busiest airports buzzed around him, “Pete” relaxed in the terminal on a May afternoon waiting for two things: The call to board a flight for a long-needed vacation and a phone call. At stake was a $60 million life insurance policy Pete needed to provide liquidity to his estate in the event of his death. Otherwise his heirs may have to sell assets, including the successful business he built from the ground up, to cover estate taxes. Pete knew his was a complicated case. The amount of life insurance he already owned made this new application a tough sell to insurance carriers. The size of the new policy also raised concerns about whether Pete could pay the premiums. The case involved his insurance advisor, his accountant, his attorney and a lot of people Pete never met who only knew him as “John Doe” for the majority of the process. Pete needed complete anonymity, lest others try to solicit his business once word got out about the size of his insurance needs. The call ended a six-month process that demonstrates the value of working with CreativeOne on complex life cases. The case also epitomizes what can be accomplished when relationships are forged, when dedicated professionals go above and beyond and when all parties involved work toward a common goal. In November 2012, he received a call from the senior partner of a firm with which CreativeOne had had a long-time relationship. The partner, John, had worked for years with a high net-worth client who was the sole owner of a very successful, highly specialized business. This client, “Pete,” had a fair amount of life insurance coverage already. But a recent review revealed the need for additional estate liquidity. As with most large cases, the various moving parts added complexity. First, the client and advisor requested that the client remain anonymous through most of the process. The client was a well-known businessman and leaking his identity would likely have caused a flood of solicitations from other insurance professionals. Through relationships with carrier representatives, CreativeOne was able to keep Pete’s identity a secret until it was absolutely necessary, even performing informal inquiries without his name. Second, as an astute businessman who wanted the best deal, John required objectivity when it came to selecting a carrier to issue the policy. CreativeOne researched the full breadth of its available life insurance products and presented John with several options to show his client. Once a direction was agreed upon, hurdles still existed before Pete could receive his policy. Early in the process, the selected insurance carrier, John Hancock, expressed concern about the new application. The client already owned a substantial amount of insurance and John Hancock’s underwriters wanted more in-depth financial data about his personal finances and those of his company. They wanted additional proof that there was a legitimate need for the additional coverage being sought and that the client could make the premium payments. CreativeOne responded to the concerns by collecting key financial data from the client, through the advisor. John said CreativeOne’s team members knew exactly what information the underwriters needed and how to present the financials in a way that they fully understood the client’s need for the insurance and his ability to pay for it. “If you have somebody with experience in these cases, they can explain the financials to the insurance company and explain why the coverage is justified,” said the advisor. Something else clicked with the team. His background working in the business market made him question whether Pete had key-man coverage, which he did not. This type of policy is designed to protect a business from the loss by death of an individual who is critical to a company’s success. Since Pete is the sole owner of the business and has highly technical skills, our team believed his company would struggle to survive after his death. In fact, after analyzing the business more closely, it was determined that it would take four or five individuals to replace him. That was enough to convince Pete to add key-person coverage to his personal coverage. Upon his death, the proceeds can be used to keep the business afloat and to recruit the talent needed to keep it operating. The key-person policy was placed in a trust so as not to inflate the value of the business. Can’t wait to see how it turns out? Call your CreativeOne Life Sales Team for the whole story. Be one of the first to find out how the case was placed!